At an induction ceremony in Vancouver, BC on Thursday, May 31, 2018, I·SPARC Elder and Senior Advisor Alex Nelson ‘Ok’wilagame’ joined sport legends such as Terry Fox, Rick Hansen, and Pat Quinn as he was awarded the BC Sports Hall of Fame’s W.A.C. Bennett Award for his outstanding contribution and leadership in sport. The W.A.C. Bennett Award is the most prestigious honour awarded by the BC Sports Hall of Fame presented to individuals who have made significant, unique, and lasting contribution to sport in BC and beyond. Alex is a proud member of the Musgamagw Dzawada’enuxw First Nation of Kingcome Inlet, B.C. He is a founder of the Aboriginal Sport and Recreation Association of BC, a founding member of the Aboriginal Sport Circle (Canada’s national body for Indigenous sport and physical activity) a member of the Provincial Leadership Team that created the Aboriginal Sport, Recreation and Physical Activity Strategy for BC, first Chairperson, three-time President, and two-time Team BC Chef De Mission of the North American Indigenous Games. His passion for soccer has earned him many athletic awards, and he has been coaching youth, women’s, and men’s soccer teams for over forty years. As a survivor of seven years in the Alert Bay Residential School system, sport has always been a vehicle of freedom and healing for Alex. 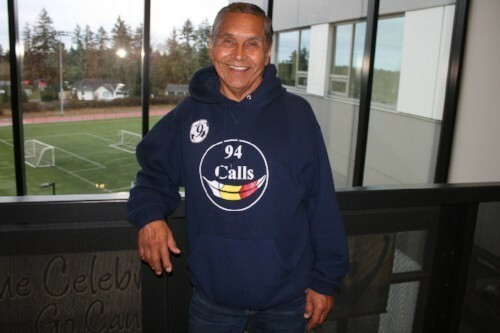 He continues to elevate Indigenous sport across North America, bringing his love for soccer and stories of survival and resilience to communities, schools, universities, and government, with the message “my responsibility is to give to the next generation what sport has given to me”. I·SPARC would like to congratulate Alex on his well-deserved induction, as we continue to be guided and inspired by his passion for sport, trailblazing leadership, and dedication to improving the health and well-being of B.C.’s Indigenous people. Article written and published by ISPARC on June 12, 2018. Follow this link for the original article. SportMedBC feels incredibly privileged to know and work with Alex and want to celebrate his induction into the BC Sports Hall of Fame. Alex works closely with the Aboriginal Healthy Living Activities which includes the SportMed Aboriginal RunWalk Program. He is an absolutely incredible individual and the honor is well deserved.